Although I wrote my Night Before the Race yesterday, my Melbourne race report is taking me some time to write. As you know, I always write monster-long race reports with far too many details… but I like being able to go back and re-read everything I was thinking. I’ll have that live tomorrow, but today, I wanted to talk about some new health goals for 2015 – and specifically, a new morning routine. Spoiler alert: I did really well at the race on Sunday, and it’s now gotten me thinking about what else I am capable of achieving. One thing I messed up this weekend was that I didn’t eat breakfast before my race. I typically eat a 200-300 calorie bar of some kind before I race; however, in training, I had typically gone out on an empty stomach, and the night before the race, I had a much bigger meal than normal. I decided to skip breakfast as a result, but now I’m wondering if eating breakfast beforehand could have helped me to perform even better. We’ve heard a lot in the past about how breakfast is the most important meal of the day – dieters are told that skipping breakfast will result in them scarfing down far more calories the rest of the day. However, some new research last summer found that this wasn’t exactly true – non-breakfast eaters didn’t tend to eat any more than breakfast eaters; however, they did move a lot less. Translation: not eating breakfast may not change your calorie intake, but it will change your calorie output. I like to stay really busy, move around during the day, and of course get in a good workout, so this study makes it clear that properly fueling your body is really important to achieve those goals. Otherwise, I wouldn’t have the energy to stay active and GSD! I’ve already written about some of my resolutions for the year… but you’ll notice that none of them have to do with health. I feel pretty good about where I am health-wise just living in Colorado; there are so many active and healthy things to do that I feel like I can stay in reasonable shape without having to focus on it and keep it top of mind! However, I also feel like I have definitely lost a lot of fitness in the last six weeks since my arm surgery – and beyond just losing some strength, I’ve lost my routine. I’ve written before about how important it is to me to be consistent with my workouts. I heard this phrase a few years ago and it’s always really resonated with me: “If you try to work out every other day, every day becomes the ‘other day’ and you never end up exercising.” I really like to go to the gym at the same time every day and make it into a daily habit, but I make sure to vary the type of workout and the intensity so that I don’t get burned out. It’s not something I really have to think about; some days I just feel like weight lifting and other days I’d rather do yoga. And hooray for the fact that whether or not to work out is not a question for me… or at least, it wasn’t before surgery. 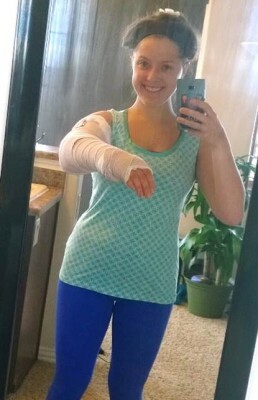 I may have worn workout clothes all the time for weeks after surgery, but there was not much normal exercise I could do with this cast on my arm. Using the gold-standard method for habit formation that Charles Duhigg proposed in The Power of Habit, my “trigger” used to be that as soon as I woke up in the morning, I would immediately put on my gym clothes and then go to the gym. Ideally, I did this before even opening my laptop, although I do check email on my phone to see if anything is urgent. (I’m less likely to spend a lot of time responding on my phone and so most stuff just waits until I get to my computer and can type faster.) Lately, though, I have completely fallen out of the habit of working out when I wake up, instead trying to do it “at some point” in my day. Guess when “at some point” comes? That’s right, never – life is too busy! So now that my arm is getting back to normal, I need to get back to my trigger/habit method of gym-going. At my PT session yesterday, we tested my left hand’s grip strength, and I’m up to 18kg from the 2kg I had tested at toward the beginning of January! I still need to get up to 28kg in order to get back to “normal”, but I’m happy with that progress, and thrilled that the surgery was at least 2/3 of the way successful at restoring hand function! On a totally cosmetic note, the scar is also looking a lot better, and since it’s on the inside of my arm, very few people see that part of my arm anyway. On mornings where I have a normal-length workout (i.e., not a long run/hike/marathon/ski trip, but a group fitness class or less than an hour planned at my apartment gym), I usually wait to eat breakfast until after I’m done exercising. But on days when I have a long effort, I definitely need to fuel up in order to have the energy to accomplish my workout goals. So when I was offered the opportunity to work with Belvita and V8 to talk about “morning wins”, I thought it was a really timely post idea. I was able to pick up the new Belvita Chocolate Breakfast Bites at Target. At first, I wasn’t sure quite where to find them – were they with the cereal? With the cookies? 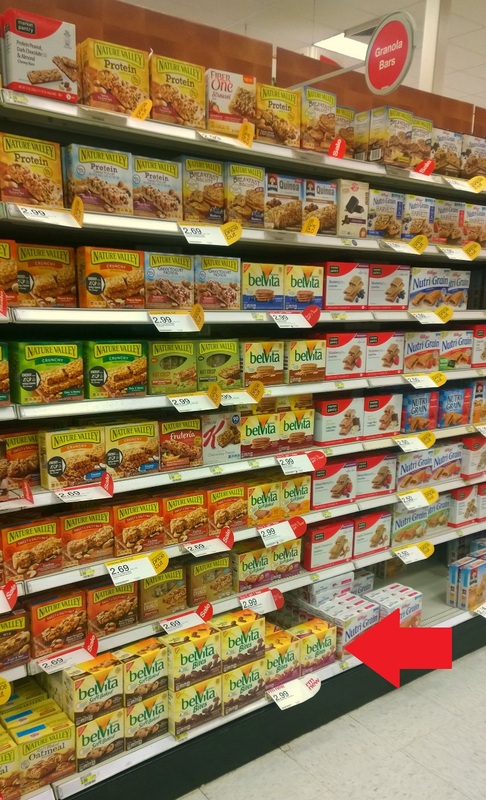 – but ended up locating them in an aisle for “granola bars”. They definitely aren’t made of granola, but these days, I feel like so many foods defy classification! The arrow shows where to find them. 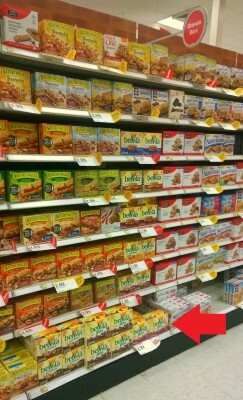 Since they are a new product, Target also has a little sign pointing that out. Although they were already reasonably priced at $2.99 for a six pack, I was psyched that there was also a coupon available on the Cartwheel app for 20% off. This was my first time using the Cartwheel app, but basically it’s just mobile coupons that you can have your cashier scan for an extra discount; I was even able to just use it on the web rather than installing an app on my phone. Sweet! Speaking of sweet, the Belvita bites turned out to be chocolatey and yummy but not too sweet – kind of like an Oreo but without the filling. Having lots of little “bites” instead of one big cookie makes it feel like you’re getting more bang for your caloric buck, and I liked being able to munch on them instead of just wolfing down a whole protein bar (like I do a lot of mornings) and then feeling unsatisfied. I also like that I can keep a pack at my desk and have just a couple of them for a mini “chocolate fix” in the afternoon, without destroying my diet.I also checked out V8’s new product, the V8 Veggie Blends. While I’m normally leery of processed juices because they have tons of added sugar and chemicals, I was really impressed that the ingredients list for this was long but full of simple ingredients I knew. The Healthy Greens juice contained: water, spinach puree, yellow carrot juice concentrate, concentrated fruit juices of apples and pineapples, citric acid, vegetable juice blend (cucumber, celery, kale, romaine, spinach, green bell pepper), natural flavoring, vitamin C, vitamin E, huito juice concentrate for color, watermelon juice concentrate for color, beta carotene. 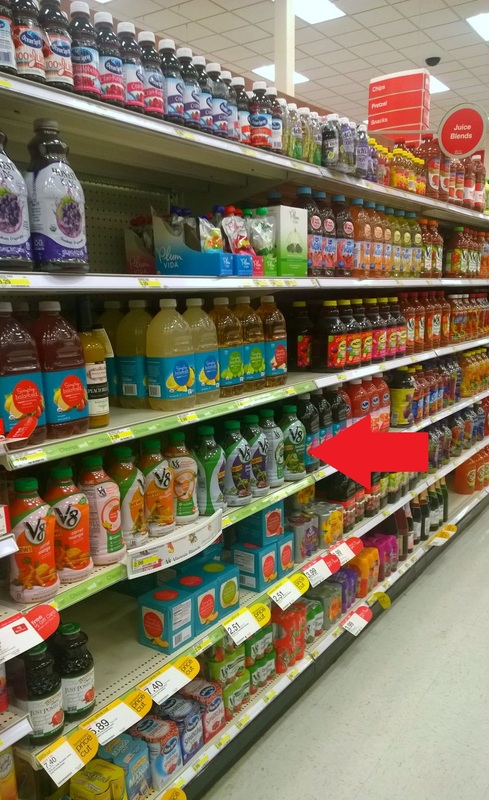 Despite being made from all pretty wholesome ingredients, it’s shelf-stable (until you open it) and was therefore in the shelved juice section at Target, right by all the other V8 juices. Although I will gladly drink both flavors, I slightly preferred the Purple Power. It tasted sweeter to me, but still had only 11g of sugar – not bad at all for a juice! The Purple Power also clocked in at only 50 calories instead of 60 calories, but those are so low for a (non-artificially-sweetened) juice that I’d feel great about drinking either. 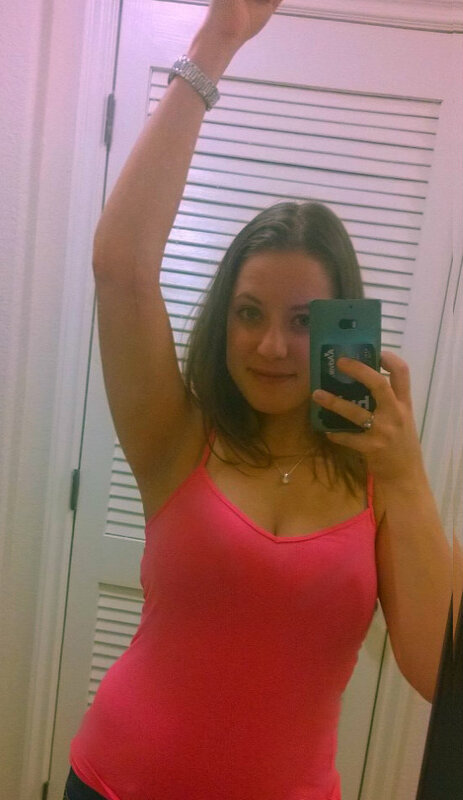 Finally, my shopping trip at Target ended up with an impulse buy: a cute new tank that was on sale for only $11 (though it’s still only $17 regular price online), and a new pair of capris that has a side stripe in the same pretty matching fabric as the top (they were $27). I really love Target’s C9 collection – all the pieces are usually pretty affordable, and they have a lot of cute designs! It wasn’t really in my plan to buy a new workout outfit, but I’m thinking that having a new fun workout outfit may get me extra motivated to get to the gym in the morning :) It’s nice that Target sells so many different things in one place – the one-stop shopping is certainly efficient, but sometimes I run into trouble with buying more than I intended on a shopping trip! I really love that the V8 Veggie Blends helps you add some veggies to your routine – and since it’s so low in calories, I’m considering adding it as another part of my morning routine before I head to the gym. Maybe I could even freeze it into a yummy smoothie and then put it in a bowl with some tasty toppings, kind of like the acai bowl I gobbled up for dinner in Puerto Rico? All I know is that I definitely need to get back to my morning trigger/response of working out shortly after waking up – and if I’m tweaking my routine anyway, I might as well add a few other small morning wins to the plan. I’ve already gotten TED Talk watching down to a science; now it’s time to include some health-related tasks in my morning routine! Your arm is looking much better! 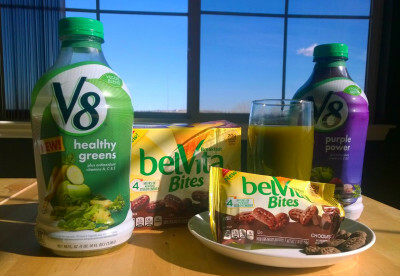 I like the moves that V8 and Belvita have made to be healthier brands.